This cast concrete relief (1973) by William Mitchell in the underpass beneath St George’s Way to Park Place depicts scenes of contemporary life. William George Mitchell, born in London in 1925, trained at the Southern College of Art, Portsmouth, and at the Royal College of Art where he won a scholarship which enabled him to study at the British School in Rome. He established the William Mitchell Design Consultants Group, and produced abstract sculptures in concrete, wood, plastics, marble and brick. 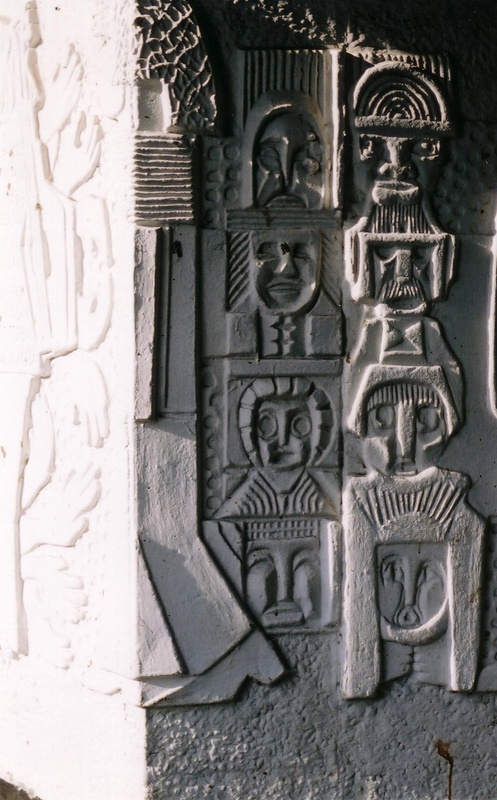 Among his other public sculptures are the abstract relief decoration of the porch and belfry of the Metropolitan Cathedral of Christ the King Liverpool, and wall reliefs for Watergardens in Harlow New Town, 1963. This page was added on 13/01/2011. The delight and interest of relief murals in public places is that every time you pass through you see all sorts of destails and enjoy the piece. This is accessible art in a good way. So much better than bland blank walls. In the relief you can see more of the aspirations of the time in the period it was made. Good stuff! I believe that’s the relief from the underpass that connects to Market Place, not Park Place. The map would seem to confirm this. Whoops! Well spotted, Tim. This is indeed the Park Place underpass, and not the Market Place underpass, which actually has an abstract mural also by William Mitchell. It was most interesting to meet him when he paid a recent visit to Stevenage and saw his work – a shame that the Longship mural was no longer there. You will see that I have corrected the map. Ah yes, it was just the map that was wrong, my mistake. Yes, when you think about it, it’s simply unthinkable that some third party can just come along and destroy an intricate and historic piece of artwork like what happened with the Longship. And now there’s just a tiny unsightly car park left under the empty building. What a waste.